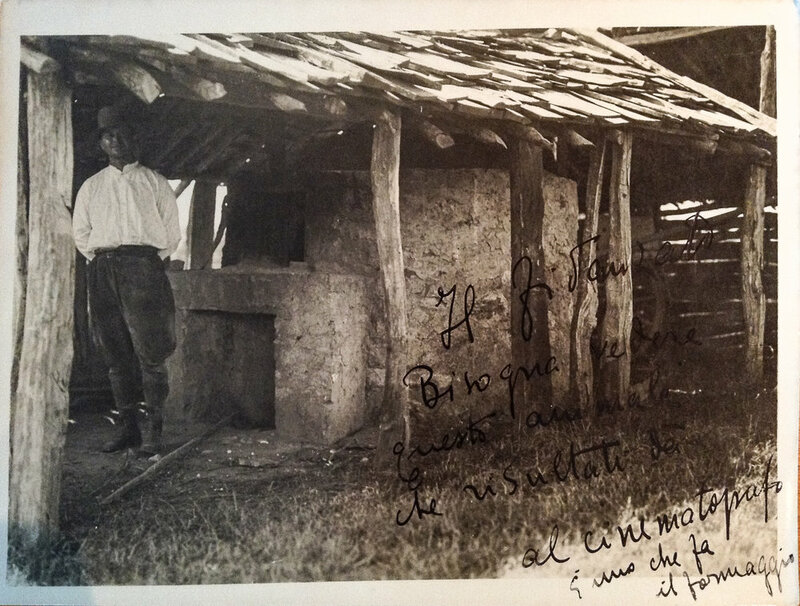 Photograph taken by Giovacchino Forzano, undated. Central Archives of the State, Segreteria Particolare del Duce, Carteggio Riservato, busta 85 Forzano. Property of the author. A few years ago, I was rummaging through moldy, dusty folders at the Central Archives of the State in Rome, Italy. My research project at the time had a strong focus on the history of Italian fashion before the Second World War, especially during Fascism. In particular, I was in Rome trying to find some kind of evidence on the possible interrelations between costume and fashion in national cinema. Official reports, contracts, personal files… Anything would have been helpful to my cause. I already knew that the 1930s were a time in Italy in which film productions did not generally employ costume designers, therefore actors were supposed to provide their own costumes. Things changed later with Cinecittà, the only state-owned film studios in Italy, but it would only begin its activities in 1937. On the other hand, I also knew that, in 1933, stage director and playwright Giovacchino Forzano decided to build the very first self-sufficient, vertically integrated film studios in Italy. This ambitious project included a proper costume department with an in-situ costume atelier, seamstresses, set dressers, separate dressing rooms for main actors, and bigger fitting rooms for extras. Thanks to the support of Mussolini, with whom he had a strong personal relationship, Forzano opened the Pisorno Studios near Pisa, Tuscany in 1934. Could this almost forgotten event help me reconstruct the history of the first proper costume department of Italian cinema? Letter to Alessandro Chiavolini from Giovacchino Forzano. Central Archives of the State, Segreteria Particolare del Duce, Carteggio Riservato, busta 85 Forzano. Property of the author. After a week of research, I could only find bits and pieces of evidence that vaguely related to the costume department at Pisorno. I kept going, though. The last files were a collection of private messages (letters, telegrams, hand-scribbled requests for consultation) between Forzano and Mussolini. At the bottom of the pile, I found a large sheet of paper: it was folded in two and when I opened it, two glossy, black and white photographs slipped out. Someone had scribbled something over them. The first photograph showed a young woman standing, her hands on her hips, wearing a collared dress, a pair of small earrings, and a ring on one finger. Her torso and her arms occupied most of the surface of the photo, shown from a low angle, with a three-quarter shot. Her hair was dark, short, and slightly curly, and her facial expression was gentle and confident at the same time as she gazed directly into the camera. The comments enthusiastically read: “At the 72nd km of the road to Terracina, I found her while she was washing clothes. The blacksmith’s sister. She is magnificent on the screen.” She, indeed, looked splendid to me as well in such a powerful pose. The second picture showed a young man with the inscription, “The fiancé. One must see the outcomes of this animal on the big screen. He is a cheese maker.” Why did Forzano think that the man was an animal? He looked dapper in his bright white shirt, knickerbockers, and hat, despite his bucolic backdrop and his average occupation. His face looked distinctively mellow and relaxed in a shot taken from afar as the man was leaning close to what seemed to be a big brick oven. I presumed that he was called “an animal” because of a sort of physical magnetism, which Forzano envisioned to be perfect for the screen. I immediately realized that Forzano’s use of amateur actors and authentic locations could be considered a forerunner to Neorealism. This form of visual realism transformed Italian cinema between 1943 and the 1950s, breaking from a repressive past and its compliant, escapist cinema. Nonetheless, more than ten years before, a main player of that compliant industry was already looking for unexperienced, fresh faces to cast in film productions shot on location. I knew from secondary sources that Camicia Nera did eventually employ nonprofessional actors as Forzano wished, but there is very few information available on those who participated. There seem to be no record of the actress who portrayed the blacksmith’s sister. When I watched the film, though, I noticed a certain resemblance between the actress and the woman in the photograph. The same goes for “the fiancé,” but his scenes are very few and the only copy of Camicia Nera that I could put my hands on does not excel in quality. Did his raw magnetism persuade Forzano to cast the cheesemaker after all? I’m not sure, but this was nevertheless an incredible little treasure for me to discover. “Camicia Nera – Documentari – Scheda video – Portale Luce Camera”, Archivio Luce, Camera dei Deputati, accessed August 30, 2016, http://camera.archivioluce.com/camera-storico/scheda/video/IL3000084169/1/Camicia-nera.html. Chiara Faggella is a PhD student at the Centre for Fashion Studies at Stockholm University, Sweden. Her ongoing research project focuses on the history of Italian dressmaking between the interwar period and the end of the 1950s.